Preparing for management’s next act of stupidity at any level of the organization is no easy task Sisters and Brothers. Unfortunately, much of what we do, day in and day out, is to react to that stupidity. React to whatever part of the contract management has violated. This is the heart and soul of the grievance process, challenging within 14 days of our knowledge of the violation. This is how we defend against the wicked and the wayward in the ranks of management. And we certainly do not have to tell you that there is plenty to defend against. As you might expect, effectiveness is something we can only achieve if we are all in this together. We are fortunate to have dozens and dozens of stewards across this great Local who are waiting for the “What’s Next” so they can take the action they’re trained for to protect your rights whenever and wherever necessary. There are occasions however, that violations of the rights we have earned over decades of contentious struggle go unchallenged. This is exactly the point where those rights begin to erode. Our collective failure to push back on even the slightest infraction is the beginning of this insidious erosion. When we look the other way when managers or employees from other bargaining units perform our work, we feed this insatiable beast. When we are treated with less than the dignity and respect we deserve and say nothing, we feed this beast. We are of the fortunate few in this world that have the right to say something when those in management abuse their authority. Stand up Brothers and Sisters as this Union stands shoulder to shoulder with you! Yeah, I know, you were screwed by the Union, and if you’ve been around for any time at all we’ve all been there. I get it, I have made these complaints myself in the past and I have certainly heard these complaints over the 30+ years in this Union. And I get it, people make mistakes, aren’t always honest, and are sometimes just friggin’ assh*%es. However, there is a good that drives this Union, and that good is greater and far outweighs any mistake ever made or misdeed ever committed. The sum of all we have ever done wrong can never match the decades of achievement and the workplace we would suffer without this Union. While it is true that this Local enjoys one of the top enrollment rates in the entire nation, we still carry way too many non-members on the backs of those who get it. Those who reap all of the benefits this Union has fought for on the Local and National level. These collective bargaining achievements do not come for free or by accident, they are negotiated and plenty of resources are committed to the success of these negotiations. Yet still there are those that continue to take full advantage of the open shop laws for federal employees and contribute nothing, other than their complaints about how bad they got it. These are your co-workers, maybe even friends of yours who are happy to accept contractual raise after contractual raise, COLA after COLA, bid after bid, and do nothing to protect these benefits as though they are guaranteed for life. Well, I am here to tell you that these benefits are not guaranteed and now face the greatest threat we have ever seen with a White House that is hell bent on screwing Postal employees out of all the benefits we mistakenly take for granted. We need you to help enlist those non-members to join this fight and join it now. All hands on deck Brothers and Sisters, check your Union Bulletin Board or this web site for a list of non-members in your facility. Reach out to the ill-informed or misguided and urge them to join. This is real and the alarm is sounding Brothers and Sisters. Perhaps it was naïve of us to believe that an opportunity existed for this report to provide a truly “sustainable path forward” for those who actually move the mail. Our hope that those at the top would consider the impact on good jobs for good people, in the end, appears to be really nothing more than fantasy. The opportunities described within the report too often go to the privateers out there looking to get a cut of the most lucrative segments of the Service we provide. Is the battle over? I say, hell no! But there is sure a lot of work in front of us. We have often described the importance of the political landscape when it comes to protecting the members of this great Union and this frontal attack on all of us is a perfect example. This, by no means, is a done deal, but it will take our full and collective political might to defeat the insidious proposals the White House has proffered. We will all have to hold accountable those who, pre-midterm election, promised to protect us against the exact BS contained in the report. The question we must ask is where do these “leaders” stand now? It would appear to some that we now have more friends on Capitol Hill than we did on November 5th, but we cannot afford to assume. The time will come when our collective voices must rise in unison to turn back those who wish to dismantle the Postal Service and in doing so, destroy us along with it. READ THE FULL WH REPORT BELOW. National President Hogrogian has made the official call for bargaining proposals for our upcoming contract negotiations. Take advantage of this opportunity to help mold the new contract and submit your ideas. Click here for the submission form. As many of you now know, the national parties have resolved a number of ongoing disputes with the signing of the Update of Regional Instruction (RI) 399 Procedures MOU. This agreement in its entirety is available for review on the National website @npmhu.org. As we have previously reported, the Union has been successful in pushing back on the employer’s most recent proposed staffing cuts in both the South Jersey and Philadelphia Districts. We again thank the fine work of those representatives in the Trenton and South Jersey plants as well as those in the Philadelphia P&DC and the NDC in neutralizing the impacts to our members. Incredibly, we are now seeing an increase in the hiring of Mail Handler Assistants in the two Philly plants. As you all know, there are still many challenges ahead as the “F-U scheduler” retools to unnecessarily screw with the hours and drop days and ultimately the lives of mail handlers. While it appears that around the Local and really around the nation, management has taken their foot of the insanity pedal, we are not of the opinion that they have abandoned their irrational scheduler. This is certainly no time for us to rest as “sure as shootin’” we will be facing additional rounds of staffing and hours manipulation in the coming months. Much of the next wave of “weaponized incompetence” will be driven yet again by Postal Headquarters’ dire predications of cataclysmic drops in marketing mail volume and made up revenue forecasts. Over the last several months we have reported management’s intention to reduce staffing in both the South Jersey District as well as the Philadelphia Metropolitan District, potentially affecting hundreds of bargaining unit members. Following a number of meetings with the employer, Local 308 and our Regional representatives were able to convince management to drastically reduce the impact if not eliminate it altogether. As many of you know, the impact to the Philadelphia NDC as well as the Philadelphia P&DC has been fully mitigated, meaning, aside from the few mail handlers that elected to reassign into the custodial craft, mail handlers are staying right where they are. Although not finalized, we expect the same for our Trenton facility and the South Jersey plant. There are certainly other challenges we will be facing in the coming weeks and months, specifically the continuing effect of the employer’s broken Function 1 Scheduler on the lives of mail handlers. We take this opportunity to thank the dozens of dedicated Shop Stewards across this Local that defend your contractual and legal rights day in and day out. The task of challenging the abuses of management is daunting and difficult work and without our stewards an absolutely hopeless proposition. 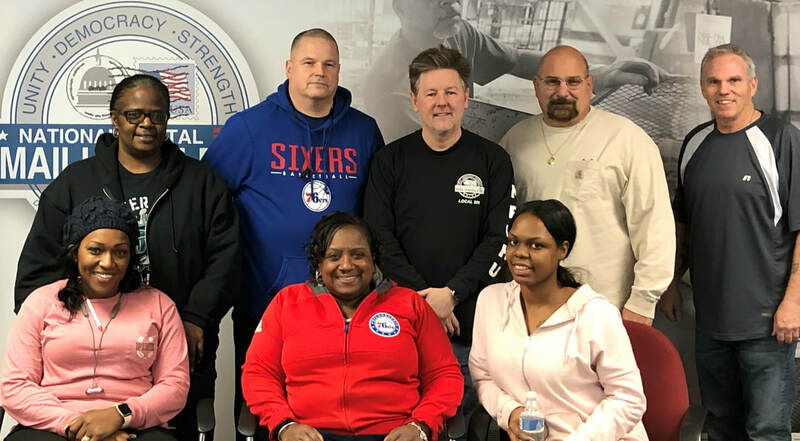 The stewards below all attended recent training workshops at Local Union Headquarters in their ongoing effort to strengthen the Union and our level of representation on the workroom floor. Thank You Sisters and Brothers for the great work you do! As the National parties finalize the effective dates of many of the recently negotiated and now ratified contractual provisions, the wage increases effective November 26, 2016 (PP 25-16) and the September 2016 (PP 19-16) cost of living allowance have been implemented and will be reflected on your earnings statement for pay period four. The pay scale reflecting that increase is available on both the National and Local web sites for downloading @ www.npmhu.org and www.npmhu308.org respectively. In addition, the March cost of living allowance has been determined to be $333 annually or approximately $.16 per hour. This increase will take effect on Saturday March 4, 2017 and be reflected in the earnings statement for pay period six. The pay scale that will be in effect on March 4th is also now available on the aforementioned web sites. As you know, retroactive pay adjustments will be necessary for all of the wages earned between pay period 19-16 for the September COLA and from pay period 26-16 for the contractual increase. The exact pay in which those adjustments will be reflected has yet to be announced. If you have any questions regarding your retroactive calculation once it is reflected on your earnings statement please see your Union representative. "...the House Oversight and Government Reform Committee introduced bi-partisan postal reform legislation. The lead sponsor was Chairman Jason Chaffetz (R-UT), but the legislation also is co-sponsored by Ranking Member Elijah Cummings (D-MD), Mark Meadows (R-NC), Stephen Lynch (D-MA). Gerald Connolly (D-VA), and Dennis Ross (R-FL-15). This legislation (the Postal Reform Act of 2017, H.R. 756) is similar to legislation that was introduced last year in the 114th Congress. That prior legislation was passed by the Oversight and Government Reform Committee, but never saw action on the full floor and died when Congress adjourned in December. The NPMHU appreciates the hard work that Chairman Chaffetz, Ranking Member Cummings, and the other co-sponsors have done with respect to this legislation." We have all probably heard the phrase “elections have consequences” at one point or another in our lives. There can be very little doubt that the 2016 Presidential Election, no matter what side of the political spectrum you may reside, will also result in “consequences” of one sort or another. It is without question that a seismic shift has occurred in the politics of the nation, and where that leads us, at this point, is anyone’s guess. What we do know is that our day to day struggles with the wayward and wicked in management will continue. And with that our right to stand up and challenge those transgressors shall not waiver. We also know that this Union, at both the Local and National levels, will continue to fight for improvements in the wages, benefits, and working conditions for all Mail Handlers. That this Union will continue the important work of securing comprehensive Postal legislation that protects the cornerstone of democracy that is the United States Postal Service. The work that you do is critically important to the Nation and we can never lose sight of that fact and more to the point, we can never let those in office lose sight of that fact. For those of you who regularly attend your ﻿Branch meetings you have heard the phrase “this is pick and shovel work” and that there is no magic bullet that will end violations of the contract by the malignancies inside management. Defending a negotiated contract requires all shop stewards, and yes even members as well, to roll up their collective sleeves and exercise their legal right to challenge any and all contractual transgressions. The surest way to lose our right to challenge management is to stop asserting those rights. There are times that repeat violations require repeat challenges and the filing of scores of grievances on the same issue. For example, rules governing temporary movement from your bid duty assignment. The Contract is not at all confusing or ambiguous regarding movement but management insists on ignoring this important right day in and day out in some facilities. It certainly can be frustrating, but all we ask is that you notify any Union representative certified to protect your rights and let them go after it. Some of our basic rights are sometimes ignored as a matter of convenience. Our job is a simple one, enforce the law and make wanton violations of our Agreement by management as inconvenient as possible.